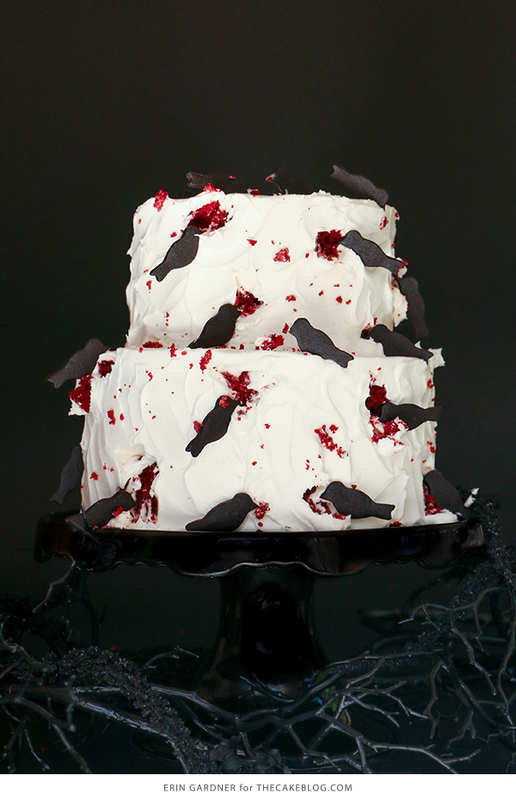 “The Birds” attack in this creepy Hitchcock inspired Halloween cake, pecking their way into a red velvet cake. 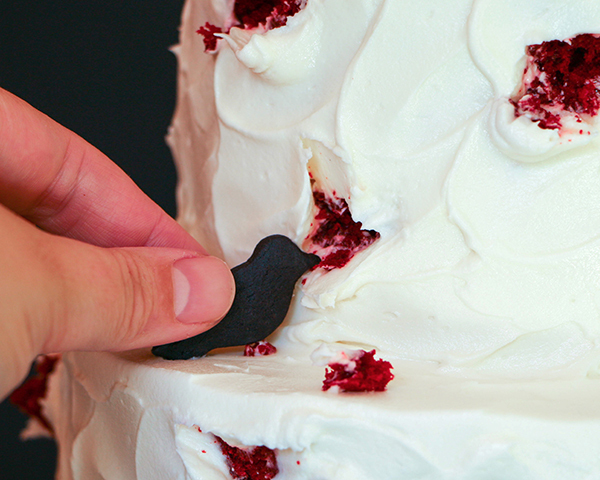 A new cake tutorial by our contributor, Erin Gardner of Erin Bakes. 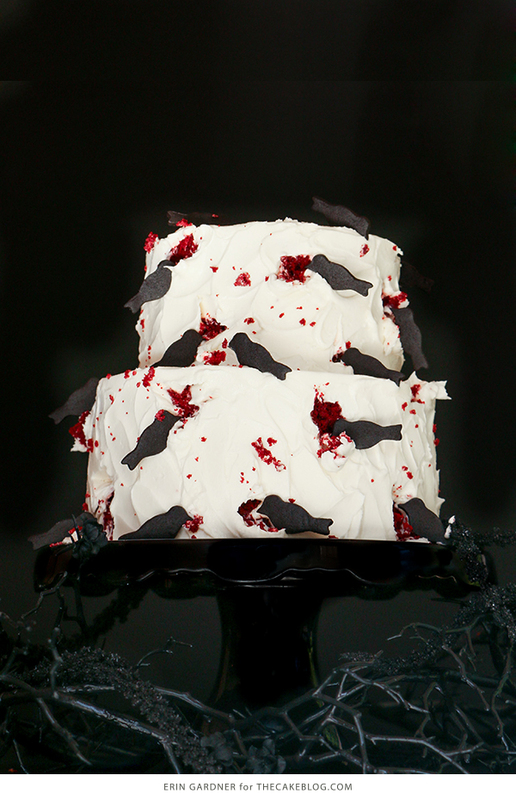 Put a sweet little bird cutter to more sinister use and create a murder of ravenous cookie crows to decorate your next Halloween cake. The grown-ups will get the Hitchcock reference, while younger party-goers will just think it’s cool that those crazy birds are tearing the cake apart. 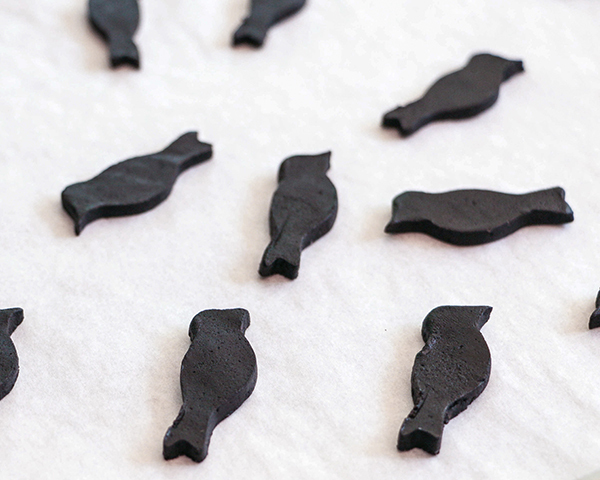 Make the bird cookies ahead of time and unleash them on the cake the day of your party. 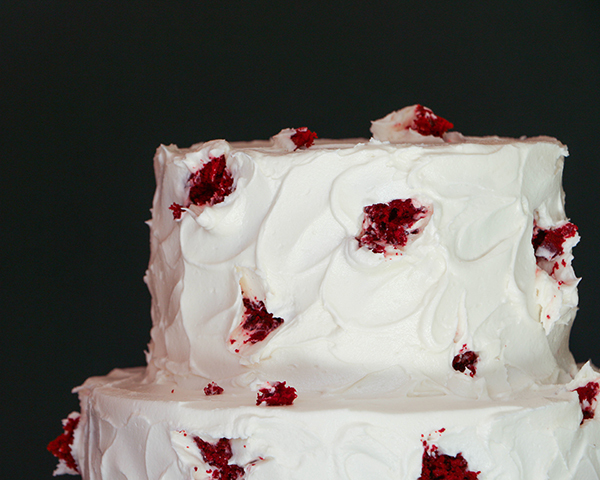 One of the best parts about this cake is how super easy it is. 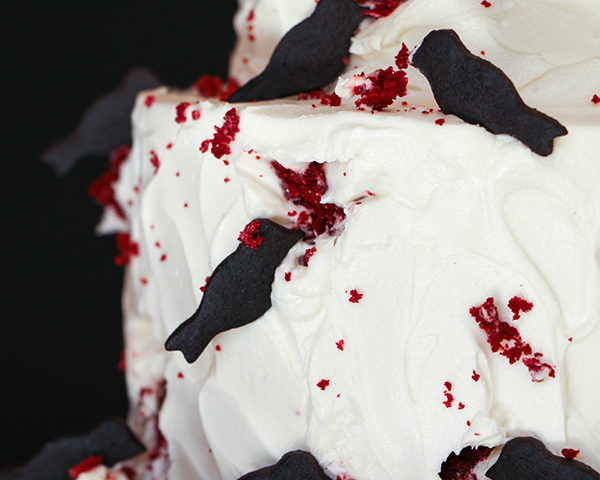 There’s no need for perfection when it comes to frosting your cake, because it’s literally going to be pecked apart! 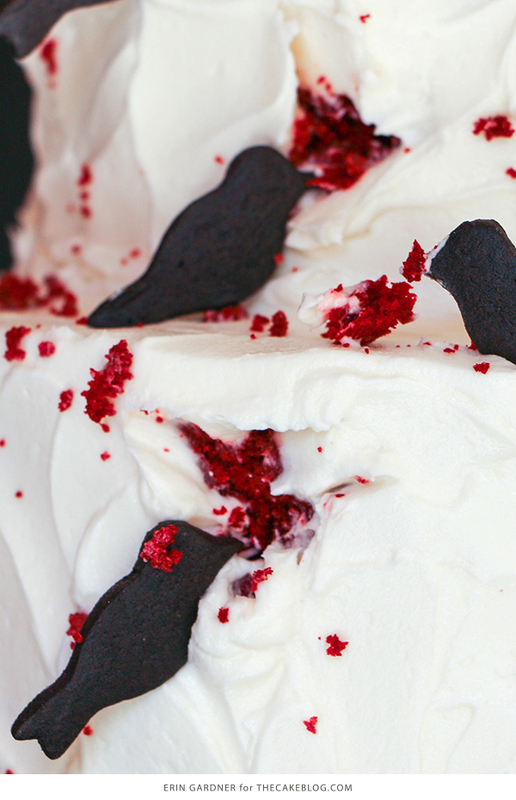 A fluffy whipped buttercream will make it easy to break through to the red velvet cake hiding underneath, but any frosting will do. Letting the cake crumbs get a little messy only adds to the fun. Position a rack in the center of the oven and heat the oven to 350°F. Line a cookie sheet with parchment paper. In the bowl of a stand mixer fitted with the paddle attachment (or in a large bowl if using a hand mixer) beat the butter, sugar, baking powder, salt, and vanilla extract until light and fluffy, about 5 minutes. Stop occasionally to scrape down the sides of the bowl with a rubber spatula. Add the egg and mix until combined, stopping to scrape down the sides of the bowl. With the mixer on low, add the flour and cocoa powder (and gel coloring if using) to the butter mixture until it’s just incorporated. Roll the chocolate cookie dough to approx. 1/8-inch thick between two pieces of parchment paper. Place the sheet of rolled dough on a cookie sheet and pop it in the fridge to firm up, at least 15 minutes. Peel the top piece of parchment paper off of the dough. Cut at least two dozen bird shapes. 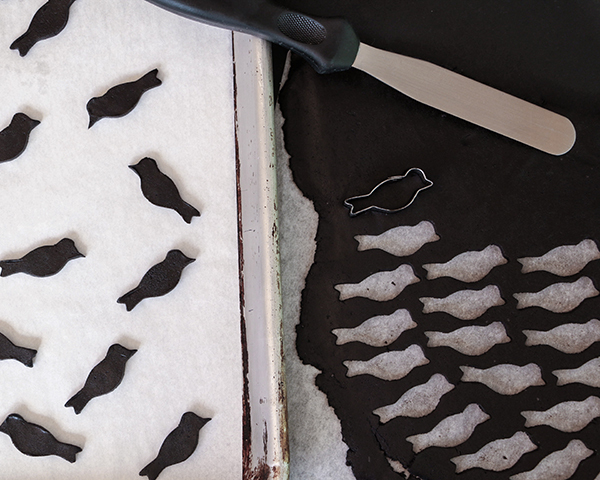 Use an offset spatula to move the birds to a cookie sheet lined with parchment paper. Pinch the beaks to make them pointer if the tip of your cutter’s beak is rounded. If the birds have softened, pop the sheet back into the fridge until the dough is firm again, about 10 minutes. Wrap unused dough with plastic wrap and store in the fridge for up to a week. Dough can be frozen for up to three months. Bake the bird cookies for 7-9 minutes. Place the sheet on a rack until the cookies are cool to the touch, about 20 minutes. 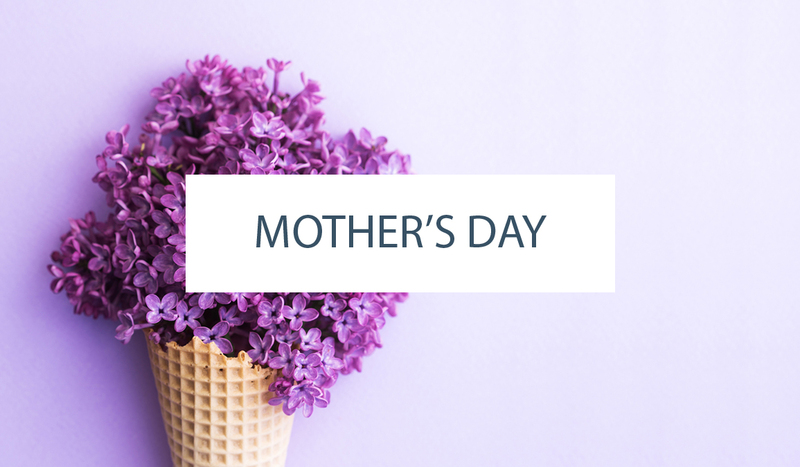 Use the cookies right away or store them in an airtight container in a cool, dry place for up to a week. 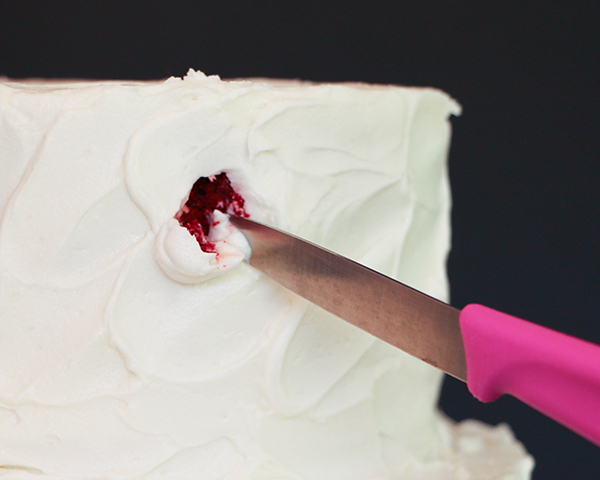 Use a small knife to gouge holes all around the sides of both tiers of cake. Reserve any little chunks of cake removed. 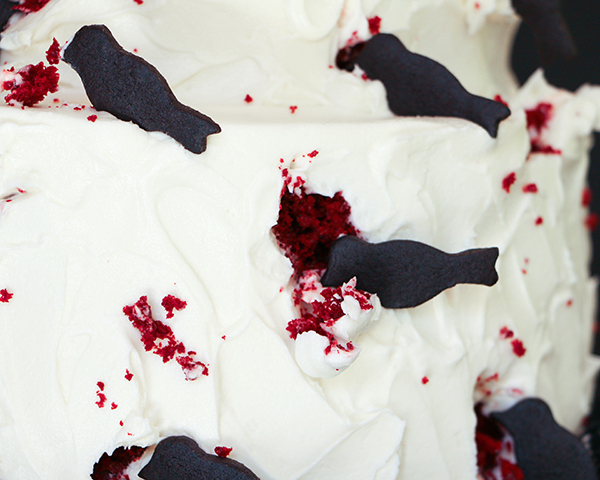 Arrange your ravenous ravens so that it appears as if they’re picking the cake to pieces. Crumble the little chunks of cake between your finger tips and scatter the pieces on the tops and sides of the cakes. The beauty of this cake is that there is no right or wrong way to do it. Have fun with it! 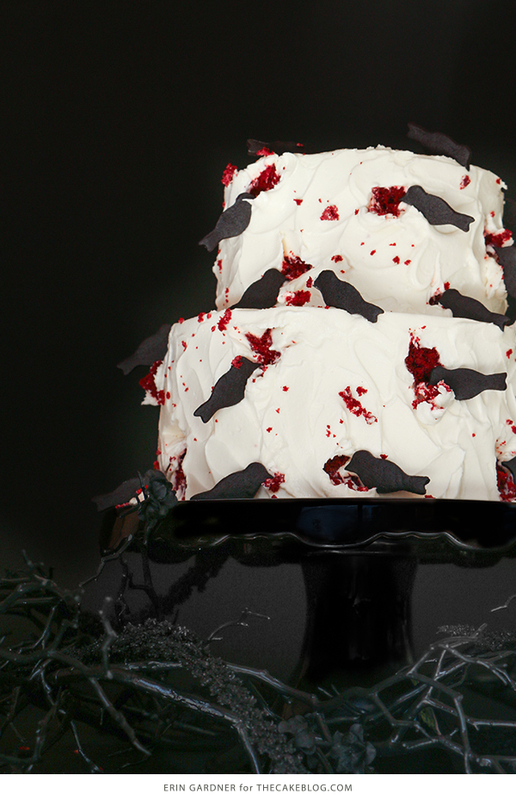 Stand back and admire your frightfully fun black crow Halloween cake! Amazingly original and totally awesome. Amazing,Nice pictures, Looking so good. 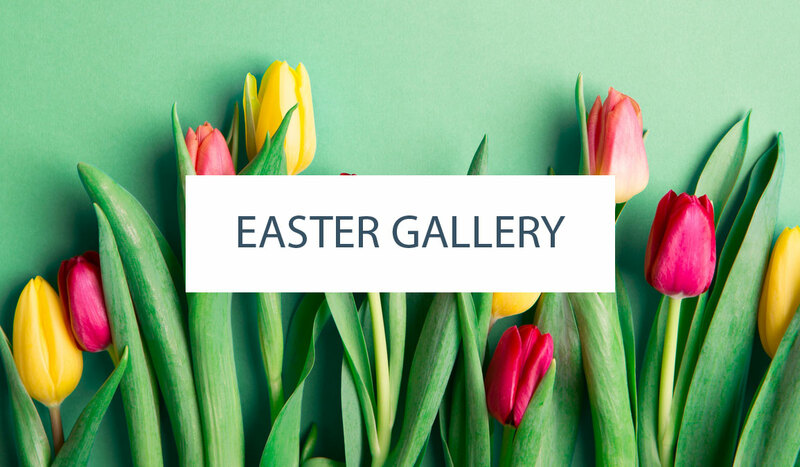 What a lovely and creative cake blogs with amazing pictures and details. Thanks a lot for this blog. 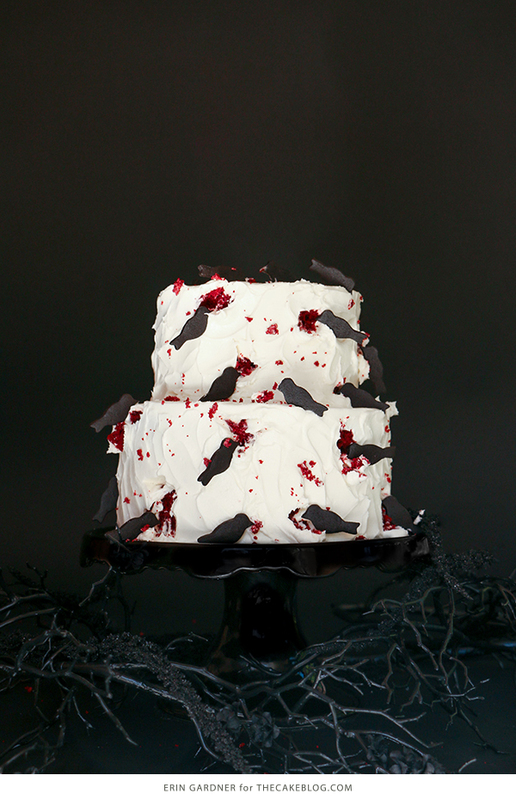 Sorry to bother you, I was just wondering what buttercream recipe you use?